What types of overcurrent devices do you install to protect motor circuits? Do you have any comments about fuses or circuit breakers? What is a design E motor, and required overcurrent protection for one? Design E motors - in my motor class this was discussed last week...they said this is an example of the code getting ahead of technology...kind of...a few years ago there was talk of developing these super efficient (E) motors...turned out these motors were so expensive to develope no one wanted to buy them....so...no such motors are on the market. I like to use a motor circuit protector (aka MCP or cirucit breaker with instantaneous only) with a solid state overload. This allows for the most flexibility and ease of maintenance. Although manufacturers like Baldor have made Super E - Premium efficiency motors, I believe they are still Design B. Design letter indicating the shape of the tourque speed curve characteristics. As I recall, the Design E NEMA spec was rescinded. . .about a year ago. I read it in a trade journal (can't find the one right now) and heard it from a State Electrical Inspector who was leading a Code Class, February, last year. 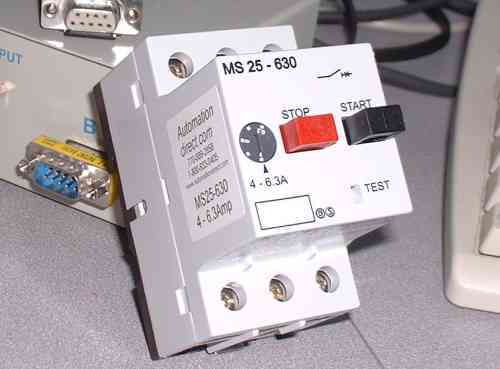 The thing I deal with everyday is the use of IEC starters and the MSP (motor starter protector). The reason I bring this up, the MSP does not meet UL 489. Which means that it cannot be used as a stand alone SSPD (short circuit protective device.) In Europe, it is recognized as such. It's really confusing. It can be used in the context of NEC 430-53c which is group motor rating. However, I get at least 10 calls a week on use of this within a motor control circuit. I came to the realization, that the cost of these devices ($19.00 - $120.00) makes them such a commodity...that I will be seeing more and more of them in place of NEMA devices. It's not a bad thing, if used correctly. This shows what the MSP looks like. I also wrote a paper on this, that you may be interested in.